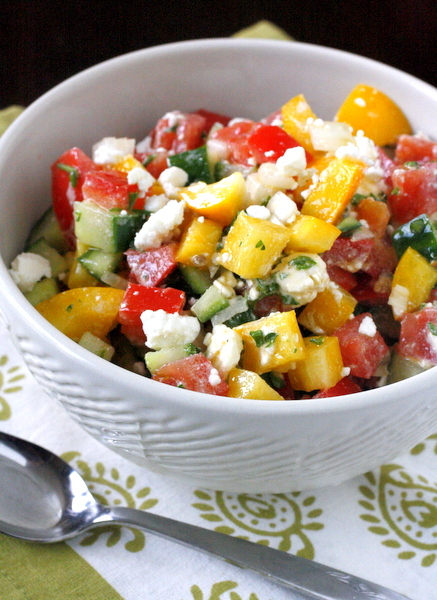 This Macedonian chopped salad is simple to make, fresh-tasting, and full of flavor! How good does this shopska salad look? 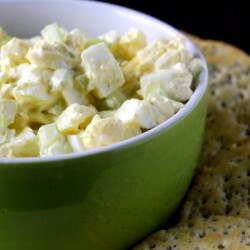 If you are anything like me, you may not have heard of a shopska salad before! 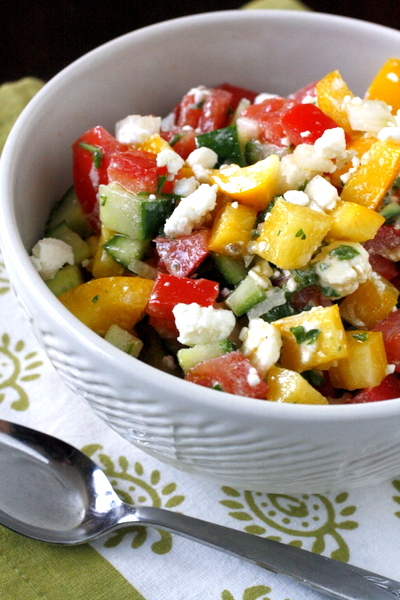 This salad is a Macedonian version of a chopped salad, and is perfect for summer. It is light and fresh and healthy – the perfect combination! Oh, and it’s also delicious. 🙂 This salad is incredibly easy to make and is perfect for potlucks, or as a light side dish for dinner. I’ve made this salad multiple times already this summer and love it more each time I make it. 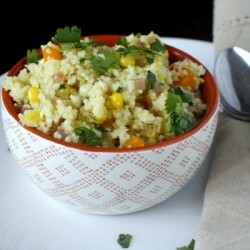 It’s refreshingly simple and absolutely bursting with flavor. Enjoy! Place chopped tomatoes, cucumbers, onions, and peppers in a large serving bowl. Add salt, oil, and vinegar to the tomato mixture; toss and mix until well blended. Taste for seasoning and adjust accordingly. 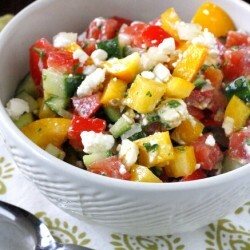 Top with crumbled feta cheese and sprinkle with fresh chopped parsley. 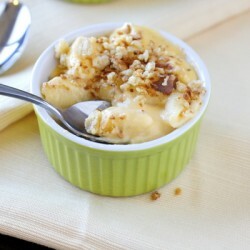 Refrigerate for about 20 minutes, or until ready to eat. Your salad is looking great and I am sure it taste just as great. 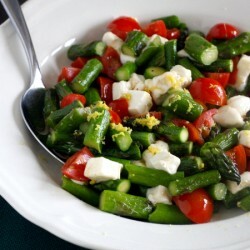 However please note that Shopska is original Bulgarian salad, not Macedonian. It’s named after a geographical area in Bulgaria, called Shopluk. The people living in this region are called shopi and this name is currently attributed to villagers around Sofia (the capital of Bulgaria). From Bulgaria the recipe spread to the kitchens of neighboring countries such as Serbia and Macedonia, where probably the confusion came from. I am sure Macedonians make similar salad, but the name it’s Bulgarian. Thanks for the background info, I had no idea!